One family’s dream come true after their father was unjustly accused. Life is recriprocal, so if you give, you receive. The Mateo-Santana family of Chongón, Ecuador, was living in a one-room home constructed of plywood and without a bathroom. The family’s children were fortunate to have been sponsored by the Young Living Academy’s sponsorship program, which allowed their parents to save the money that would have been spent on school to build a 600 square foot home. The family began construction on their new house in 2010, starting with four supporting pillars and slowly adding walls and a roof. Three years later, the Mateo-Santana’s moved in, despite not yet having a floor. Their new single bedroom home also included a bathroom, a simple luxury for this grateful family. Unfortunately, in 2013, shortly after moving into their new home, the father of the family was terminated from his job and was unjustly prosecuted for a crime he did not commit. Regardless of his innocence, he was sentenced to spend three years in jail. Upon losing the family’s primary source of income, the mother, Nadia, was forced to sell the family’s most valuable possessions to pay for accumulated legal fees and support her children. Nadia sold the television, computer, kitchen table and chairs, beds, and even the gas tank they used to cook. Still, it was a struggle for the family to make ends meet. Ivanny’s success was complicated by her family’s home situation because she had no privacy or space to study in quiet. 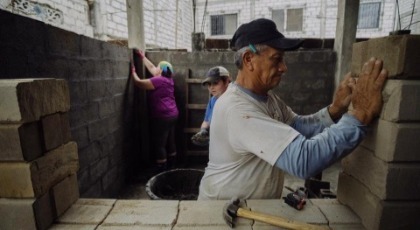 The D. Gary Young, Young Living Foundation stepped in to help, building an addition to the house which would become Ivanny’s own bedroom and bathroom to provide her with a quiet place to study and do homework as she continues her university education. We also fixed their leaky roof and remodeled another bedroom to make it more livable. Ivanny, the family’s oldest child, received her diploma in the Young Living Academy’s first graduation ceremony in 2016. This bright and ambitions student saw the pain and injustice that her father suffered and felt empowered to pursue a law degree. Ivanny is currently two semesters into her studies and is passing all her classes with stellar grades. She is working hard to follow her dream of becoming an attorney so she can help people like her father receive fair treatment. To read more about Ivanny's story specifically, CLICK HERE.